Larval and adult urodeles and anuran tadpoles readily regenerate their limbs via a process of histolysis and dedifferentiation of mature cells local to the amputation surface that accumulate under the wound epithelium as a blastema of stem cells. These stem cells require growth and trophic factors from the apical epidermal cap (AEC) and the nerves that re-innervate the blastema for their survival and proliferation. Members of the fibroblast growth factor (FGF) family synthesized by both AEC and nerves, and glial growth factor, substance P, and transferrin of nerves are suspected survival and proliferation factors. 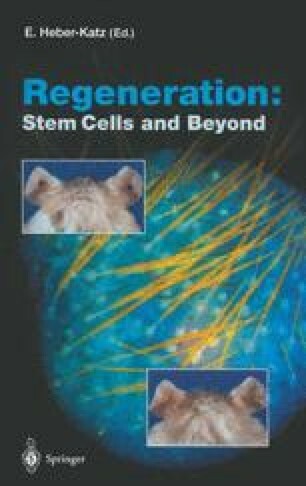 Stem cells derived from fibroblasts and muscle cells can transdifferentiate into other cell types during regeneration. The regeneration blastema is a self-organizing system based on positional information inherited from parent limb cells. Retinoids, which act through nuclear receptors, have been used in conjunction with assays for cell adhesivity to show that positional identity of blastema cells is encoded in the cell surface. These molecules are involved in the cell-cell signaling network that re-establishes the original structural pattern of the limb. Other systems of interest that regenerate by histolysis and dedifferentiation of pigmented epithelial cells are the neural retina and lens. Members of the FGF family are also important to the regeneration of these structures. The mechanism of amphibian regeneration by dedifferentiation is of importance to the development of a regenerative medicine, since understanding this mechanism may offer insights into how we might chemically induce the regeneration of mammalian tissues.